I started coloring this image a month ago. I just wasn't sure how I wanted to make the card design. Sometimes it takes awhile. The card base is neenah cs cut two times at 6.5 inches. On one of the pieces I scored one half inch and folded it back. I then added the second piece and glued it on to make the base of the card. The image is printed onto neenah cs and colored with copic markers. E00,000,21,51, Y21,26, YR21, YG61,63, BV000,01,02, V12, The butterflies were also colored with the copic markers. I used ek-success of the 3 step butterfly punch and MS for the smaller ones. I added shadow under the small butterflies. I added glitter to all of the roses and butterflies. The first and second DSP is from DCWV eastern stack. I used MS vine border punch for the vine on the right side of the roses. The leaves under the white roses I used the SU blossoms punch. I added some sukura white gel pen on the flowers for highlights. The earring were done using sukura clear glitter pen.I added glitter onto the image. 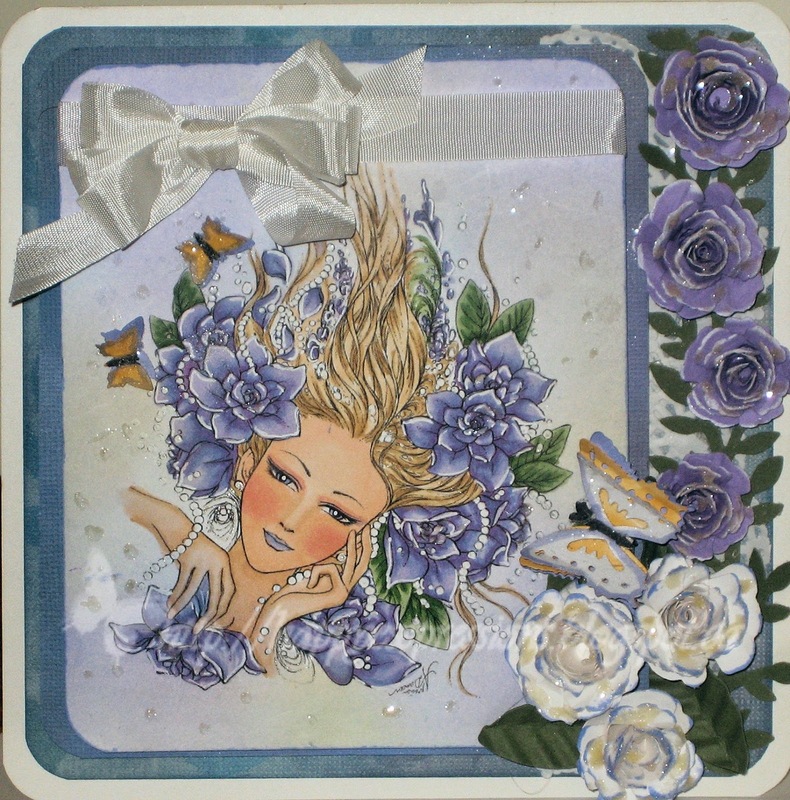 The roses were made using spellbinders small die using SU cs. The white roses are SU whisper white cs. I cut a small doily in half and added it to the side of the first layer but It really doesn't show up much. The ribbon and bow is CTMH seam binding. I hope you have enjoyed my card and found something you liked and will inspire you. What a wonderful project. Love the image and your colouring is gorgeous. Wow! Gorgeous! Your colouring is amazing! This is so beautiful, gorgeous colouring. Thank you so much for sharing your lovely creation with us at Challenges 4 Everybody. Beautiful card! Love your coloring . Thanks for joining us at Storyteller Norway.